Recruited by Magneto to battle Red Onslaught's hero-countering Sentinels, Victor Creed was hit by the Inversion spell, turning this occasional anti-hero into a full-time hero. He is now an Uncanny Avenger. A heroic Sabretooth? It'll never work! There's nothing particular about this design that makes him look heroic rather than villainous: he still has sharp claws, his frown shows off his fangs, etc. His modern costume maintains the brown and yelow colorscheme he had before, but it's a new pattern. It's a stripe down the center of the chest and continuing onto the shoulders, and he has a black collar. There's a glimpse of skin between his sleeves and his long gloves, and there are opposite-colored stripes on his forearms, ribs and thighs. If the Hulk is the dark aspect of Dr. Bruce Banner, then Kluh is the dark aspect of the Hulk. 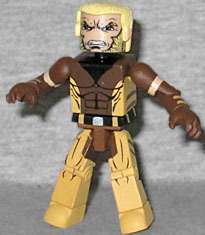 Released when the Hulk was betrayed by the Avengers, Kluh is more powerful than the Hulk, and prone to murderous rampages. Okay, not every idea can be a winner. Giving the Hulk a Hulk of his own is clever enough, but the name and the design are kind of crud. Seriously, "Kluh"? And he only comes out when Hulk is sad? Why does he look like cracked stone? Thing envy? Why are there scales painted on his forearms and ankles? Why does he have a silly white mohawk, when Hulk had a full head of hair? That's like Thunderbolt Ross losing his mustache. 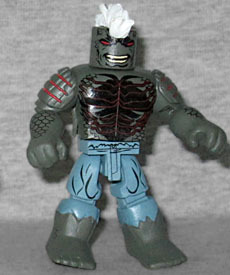 The Minimate translates the design well, but it's a silly design to begin with. Marvel Legends addendum: dat body! This entry was posted in Art Asylum, Marvel, MMMR and tagged Avengers, Hulk, Minimates, X-Men. Bookmark the permalink.